Several of us feel a special bond with our classmates (57 graduates). Several of us started first grade together. Many were together from the 8th Grades at Bogart and Watkinsville until graduation at OCHS Mars Hill in 1958. I have been a member of many clubs, groups and organizations but none have meant more than that of the Class of 58! The OCHS Class of 1958 continued its annual tradition of holding a reunion on the Saturday before Father’s Day. 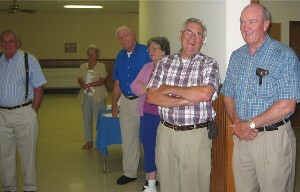 The 50th Reunion was held this year at the Farmington Community Center. After the hectic schedule of meetings in hosting the 2008 OCHSAA Alumni Banquet, the 2009 Hosts chose a quieter venue for food and fellowship. A good crowd showed up. Deaths and health and aging conditions have reduced the number of participants. However, for those who have attended regularly over the decades, it is like a family reunion. Two members, Keith Barnette and Elizabeth Miller Bradberry have never missed one. Many of us only missed because of military, illness or family conflicts. In many ways, Farmington is representative of the High School era of the Class of 58. The county and classes were smaller and lifetime bonds were formed. Several classmates actually started school in Farmington in the old school that burned- located where the present Community Center is located. Two men in the crowd have red Mustang Convertibles that have heavy shines. 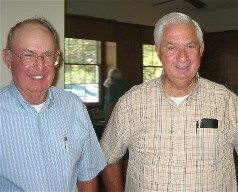 Paul Bryant (husband of Pat McIntyre Bryant) and Keith Barnette showed up in their Mustangs at gatherings in 2008. The two autos still shine and provoke a lot of attention and conversation. Several of us feel a special bond with our classmates (57 graduates). Several of us started first grade together.Many were together from the 8th Grades at Bogart and Watkinsville until graduation at OCHS Mars Hill in 1958. I have been a member of many clubs, groups and organizations but none have meant more than that of the Class of 58!